Some Nesbitt students engage in a coding exercise. ENROLMENT INCREASES: For the first time in many years the EMSB has seen its enrolment increase in the youth sector. The EMSB now has 19,561 students at the elementary and high school levels, a 267 jump from last year. There are more than 23,000 additional students registered in Adult Education and Vocational Services. With over 42,000 students in total the EMSB remains the largest English public school board in the province. KINDERGARTEN REGISTRATION: Kindergarten Registration Week for the 2018-2019 academic year will take place from Monday, February 5 to Friday, February 9. If one child from a family is already enrolled in a particular school, a sibling registration period is taking place this week. Parents are asked to register at the EMSB elementary school nearest their residence offering the French program of their choice. For more information please call (514) 483-7200, extension EMSB (3672) or log on to the Board’s website at www.emsb.qc.ca. 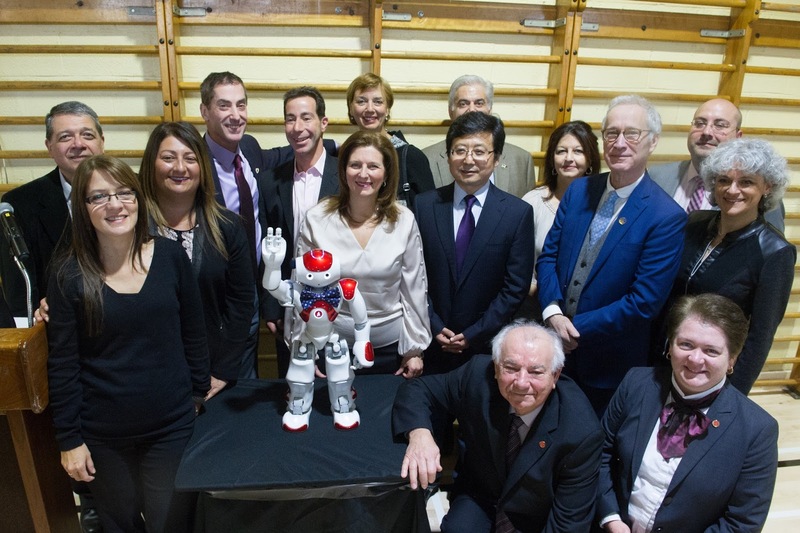 NAO the robot greets EMSB officials and guests at the press conference. ROBOTICS, CODING AND A.I. : It is no secret that at the primary and secondary level at the EMSB, robotics has played a key role – both within the curriculum and as an extra-curricular activity – towards achieving a wide knowledge and better understanding of both science and technology. Many of these schools have distinguished themselves as participants in numerous robotics competitions, not only across Montreal, Quebec and Canada, but around the world as well. They have the awards and prizes to prove it. However, to understand the mechanics of robotics and artificial intelligence, students have to familiarize themselves with the processes that go before and after the creation of a robot, such as coding. And that understanding begins right at the Kindergarten level. 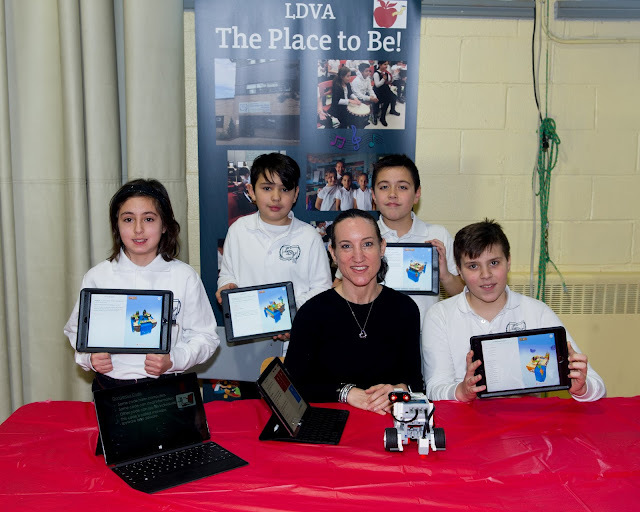 On the eve of Kindergarten and Elementary School Registration Week, the EMSB unveiled ambitious new initiatives under the theme of Robotics, Coding and Artificial Intelligence – Preparing for the Literacies of Tomorrow. 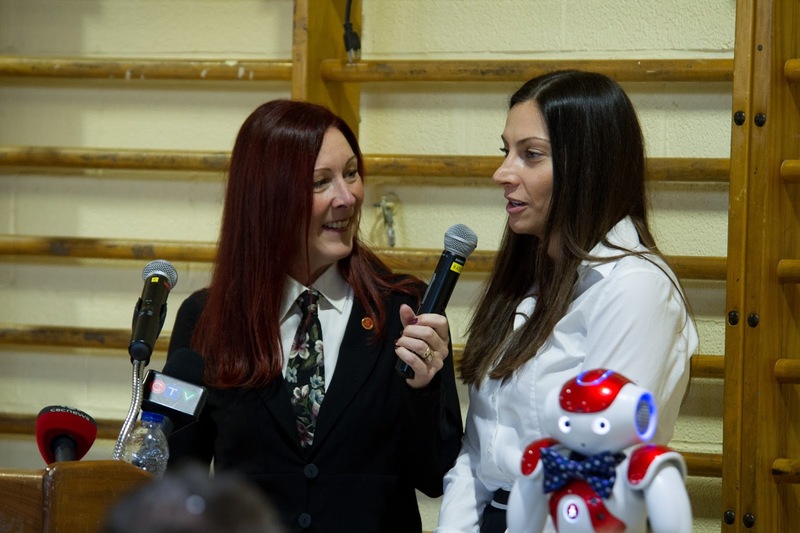 “The concept of coding and robotics are all inter-related and go hand in hand with each other,” EMSB Chairman Angela Mancini stated at a press conference held at Merton Elementary School in Côte Saint-Luc. EMSB Assistant Director of Education and Technology Services (ETS) Anna Villalta notes that students are on the cutting edge when it comes to the latest trends and innovations in technology and robotics. See the full press release. Merton students enjoy a game of robot soccer. 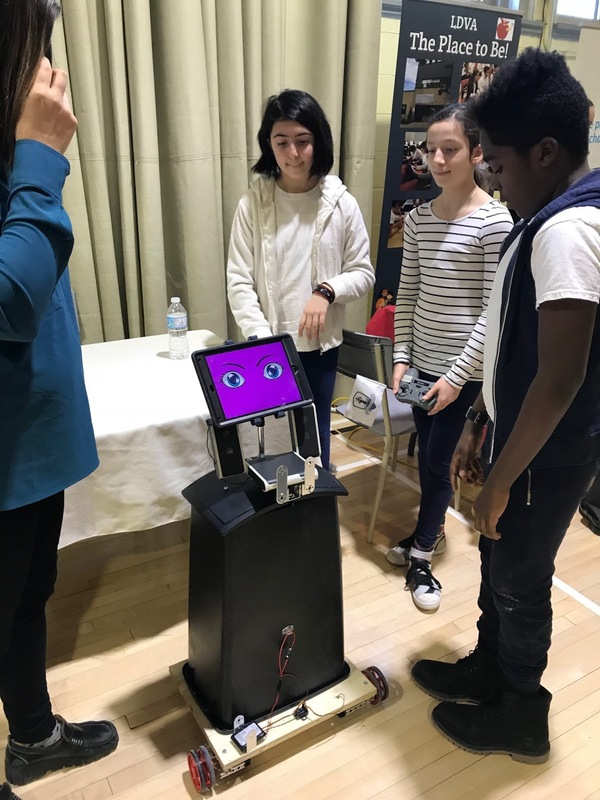 CO-SPACE ROBOT EDUCATIONAL PLATFORM: The EMSB will become the very first school board in Canada to implement a Co-Space Robot Educational platform. Used in schools in over 20 countries such as the UK, Germany, Austria, Japan, Sweden, Mexico and Brazil, the Co-Space Robot platform helps students to develop their computer thinking skills, as well as their involvement in programming, coding and algorithms, in a more fun and engaging manner. NAO ROBOT PROJECT FOR SPECIAL NEEDS: The EMSB is introducing a new robotic initiative that will specifically benefit students with special needs. 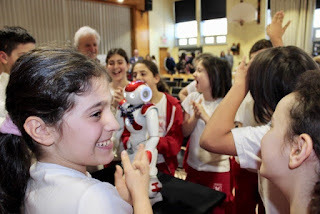 The “NAO” robot project is a collaboration between the EMSB and the team of Dr. Thierry Karsenti from the Université de Montréal, along with the support of the Education and Technology Services and Student Services Departments. “NAO” is a humanoid robot that will be programmed and coded by students, with the support of ETS personnel, based on the specific needs of the students that “NAO” will interact with. What is programmed in the robot can range from responding to instructions, singing simple songs, reading stories, questioning, to communicating with NAO by using the appropriate pragmatic language, with sentences or behaviours that could gauge how they would react to what’s been programmed in the robot. 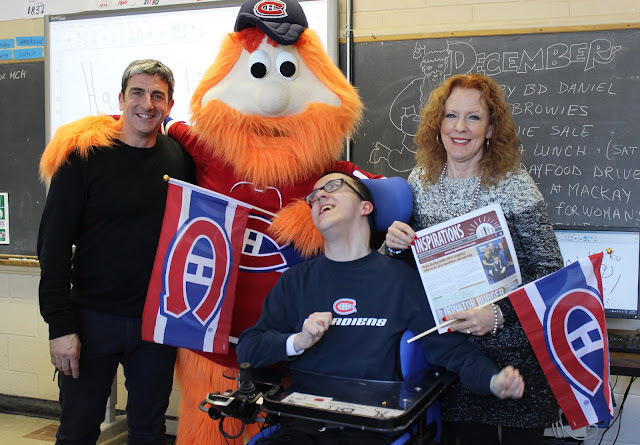 Edward Murphy Elementary School in Hochelaga Maisonneuve is already part of the program. 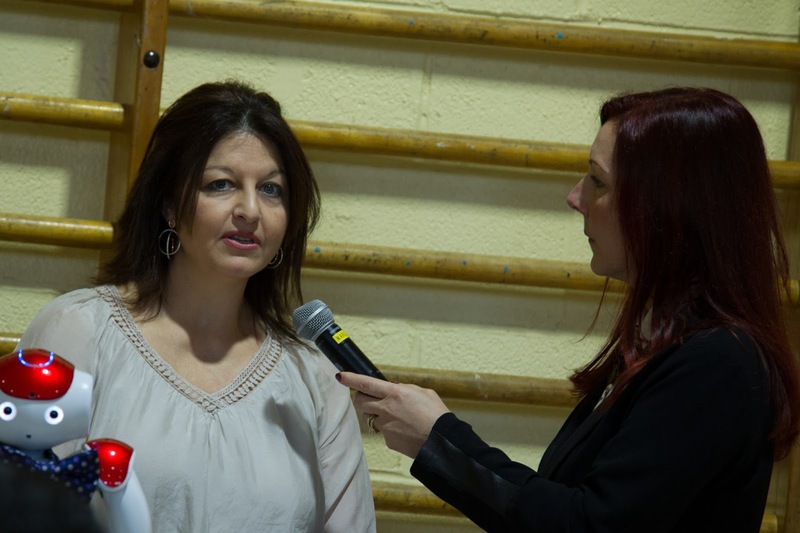 Principal Cristina Celzi spoke at the press conference. ROBOCUP INTERNATIONAL IN MONTREAL: Montreal, will be hosting the 22nd RoboCup International Competition and Symposium June 17 to 22 at the Palais des congrès. RoboCup is an educational student initiative with an international community that fosters talent in fully autonomous robotics, machine learning and programming languages encompassing all subjects of STEAM (Science Technology Engineering Arts and Mathematics). The EMSB will be playing a prominent role in this prestigious robotics event as a major event partner. Sara Iatauro, EMSB ETS Robotics Consultant, is the acting General Chair for RoboCup 2018. EMSB RoboCupJunior Quebec qualifying teams will be amongst the competing students at the international event as they have since 2001. Please the full press release for more details. NEW STEAM SCHOOLS: In January 2017 the EMSB held a press conference to introduce its STEAM (Science, Technology, Engineering, Arts and Mathematics) initiative. At the time only two elementary schools, General Vanier in St. Léonard and Pierre Elliott Trudeau in Rosemount, were piloting the program. The initiative, overseen by ETS consultants Sara Iatauro, Nicholas Doyon and Chad Leblanc, has now expanded to 15 schools. New additions are: Elizabeth Ballantyne in Montreal West; Pierre de Coubertin, Honoré Mercier, and John Paul I in St. Leonard; Coronation in Côte des Neiges; Westmount Park; Carlyle in TMR; Gardenview and LaurenHill Academy in St. Laurent; Michelangelo International in RDP; James Lyng High School in St. Henri; Dalkeith in Anjou and Bancroft in the Plateau. Jean-Philippe Groulx announces the Ubisoft connection. UBISOFT AND YOUTH FUSION: The EMSB is also pleased to announce a partnership with Ubisoft CODEX and Youth Fusion. Ubisoft CODEX unites many initiatives aimed at youth at all levels of the education system that position video games as a motivational learning tool. Youth Fusion focuses on experiential learning by implementing innovative pedagogical projects in various fields, including robotics, video game creation, entrepreneurship and fashion design. Beginning in the next school year, Youth Fusion will work directly with Ubisoft professionals to bring aspects of gaming and coding into some EMSB classrooms. Students will learn how to create video games and will focus on issues like empathy and conflict resolution and on the pedagogical side, mathematics, French, English and history. Ubisoft game developers will also be present to talk to the youngsters about jobs in the industry. Merton students work their magic. 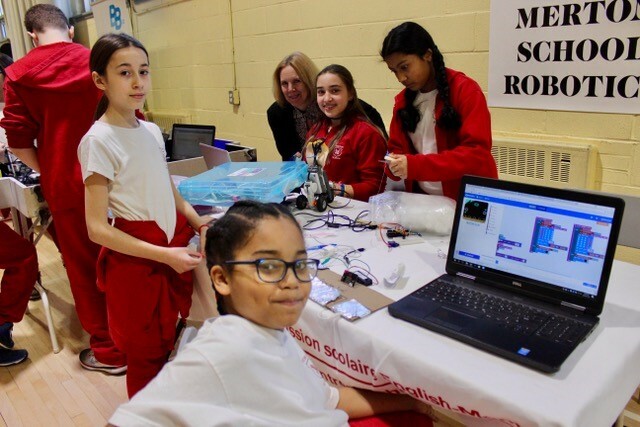 at Merton have been learning the fundamentals of computers and coding, and how to apply them to robotics, for nearly 15 years, and has the distinction of being the longest standing school at the EMSB to have robotics integrated into their curriculum. 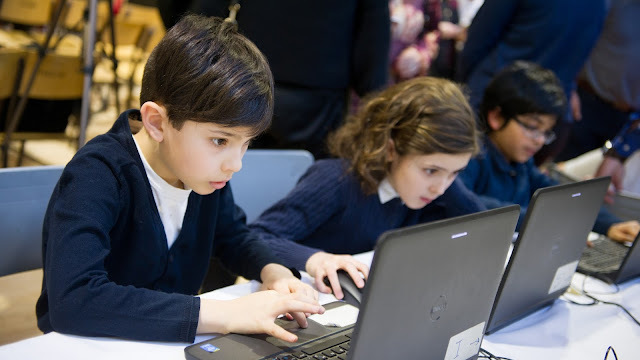 Debbie Adams, who has been Merton’s science, technology and robotics teacher since 2012, notes: “The whole world is changing, which is why robotics is a major part of the curriculum at Merton and why it’s so important to teach coding to our students starting from their first year in the school. Teaching computers and technology to them at such an early age helps them become more aware of the world around them. It allows them to be more than just users; it allows them to become creators.” See the full press release. 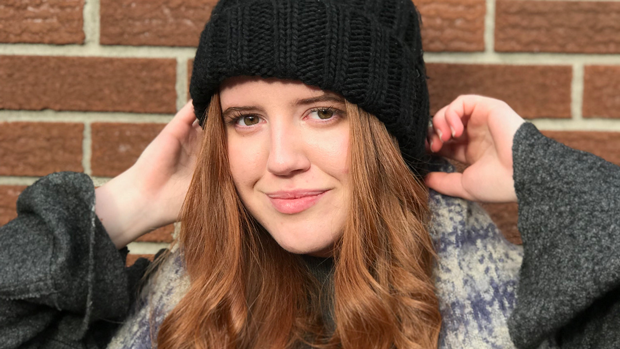 FORMER STUDENTS THRIVE: Concordia University student Synneva Furuli caught the engineering bug in the robotics program at Merton and hasn’t looked back since. 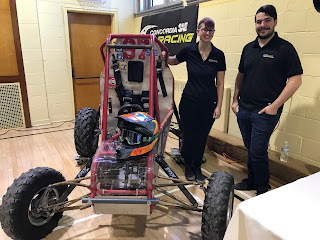 Furuli and teammate Kevin Battista, a graduate of Vincent Massey Collegiate in St. Michel, showcased the Concordia Engineering Department’s Baja off-road racing vehicle (prepared for the Society of Automotive Engineers competitions), at the EMSB’s press conference on January 26. Furuli loved building things together as a child. While playing with Lego robotics pieces at Merton, she developed her interest in how things fit together. “I knew back then that I wanted to study engineering,” says Furuli, now a third year Mechanical Engineering students at Concordia. Synneva Furuli and Kevin Battista. 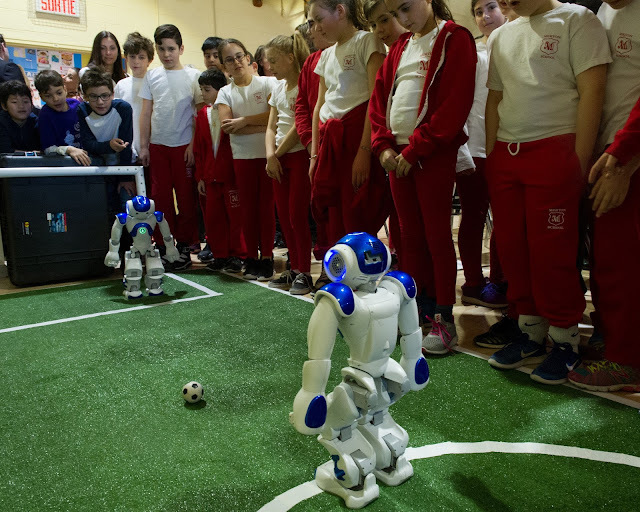 In 2006, Furuli took part in the International RoboCup competition in Germany. After graduating from Merton in 2007, she attended Royal West Academy and then completed Dawson College’s mechanical technology program. Furuli is one of the only women on Concordia’s Baja off-road vehicle team. She participates in the programming and the mechanical building of their vehicle. “The Baja is an extension of what I did at Merton, just bigger,” she says. 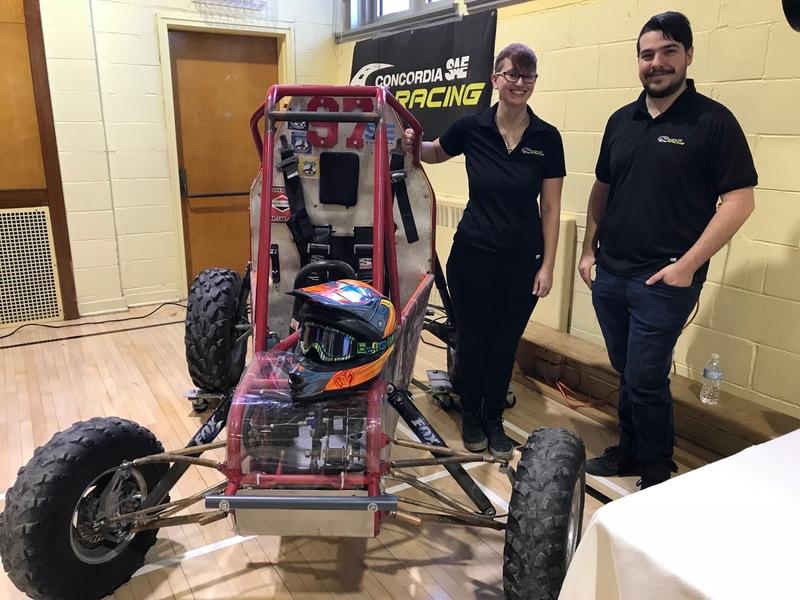 “Back then, I was on the design team, working on the mechanics of building something that would be solid and not fall apart.” This year, Furuli and her teammates will participate in SAE competitions in Quebec City and Kansas City. The team’s goal is to optimize the mechanics of the vehicle so that it can withstand physical hits and rollovers, is lightweight and can stand up to the harsh conditions of off-road terrain. See the full press release. Tanya Beccat and her LDVA students. OTHER SCHOOLS: Besides Merton, there were a number of other schools showcasing their robotics expertise at the press conference. Royal West Academy and the students of Stephan Nemeth presented Arduino, a microcontroller featuring very sophisticated technology; Martin Marcil and his students from Nesbitt in Rosemount showcased Scratch, a graphical programming language developed at MIT that teaches students how to create animations, computer games, and interactive projects; Tanya Beccat and her students from Leonard Da Vinci Academy in RDP showcased Swift Playground. a revolutionary app for the iPad that makes learning Swift interactive and fun; Patrick Charland and Jennifer Lacroix from Pierre Elliott Trudeau in Rosemount showcased their robot Rebekka, which they are working for the international RoboCup 2018. NAOVA, a Standard Platform League RoboCup Soccer game between two robots, was presented by Jonathan Fortin, Logistics Director, Organizing Committee of Montreal, Federation de la RoboCup international. Also on hand was S.A.R.A. The Robot from L'École de technologie supérieure, presented by Maxime St. Pierre, a participants of RoboCup@Home and Co-Chair of RoboCup@Home League 2018. Here are links to some of our electronic media coverage from the press conference. Stay tuned to Breakfast TV on Monday, February 5. APPOINTMENTS: EMSB Director General Ann Marie Matheson has announced the interim appointments of Evelyne Alfonsi as Deputy Director General (Education) and John Pevec as Regional Director (East sector). Ms. Alfonsi has more than 25 years of experience at the EMSB - both in elementary and high school, and more recently at the board. 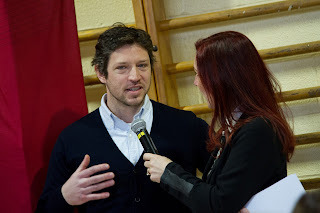 Mr. Pevec was most recently the Principal of the High School of Montreal Adult Education Centre. He has over 20 years of experience at the EMSB - both in the youth and adult sectors. Mario Argiropoulos is now the interim Principal of High School of Montreal, having served as assistant director of AEVS for the last decade. BUS STRIKE: The EMSB communicated with parents and guardians of students who utilize the Transco Bus company to forewarn them about a the two day strike on January 30 and January 31. Transco school bus drivers are presently negotiating a new contract with their employer. Last week they refused to accept their management’s contract offer. As such, notice was given for the strike. 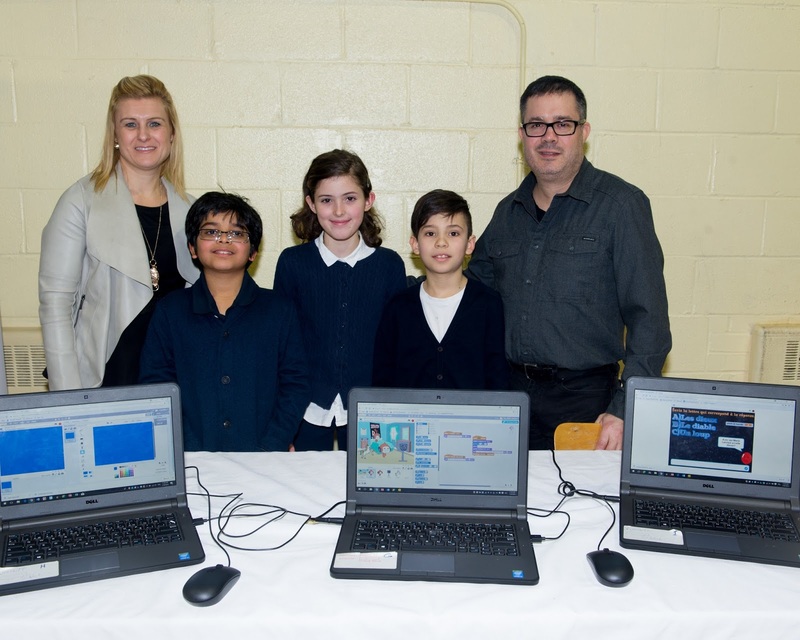 This has impacted some 6,400 students at 32 primary schools of the EMSB. The Ministry of Transportation has intervened and named a mediator. The EMSB opened up extra daycare spaces. It is understood that some parents / guardians may have difficulty getting their children to and from school and therefore, may choose to keep their children home for two days. Given that some students may be absent, teachers will be asked not to hold any exams, tests or evaluations such that students who stay at home will not be penalized. Schools will do their best to be flexible in understanding that some students may be late in the morning. The EMSB encouraged parents who know each other well to discuss carpooling and after-school play date possibilities amongst themselves to help each other out. WHY JAMES LYNG IS A SPECIAL SCHOOL: The team at James Lyng High School in St. Henri has produced a beautiful video which showcases all of the interesting programs it offers. The video was produced by Oracle Productions. Here is the video. STUDENT ADVISORY COMMITTEE: The English Montreal Student Advisory Committee has been meeting once a month so far this year. The EMSAC is composed of two students from each EMSB high school. Meetings alternate between the eastern and western sectors of the network. EMSAC meetings are also attended by Regional Director Pela Nickoletopoulos, LaurenHill Academy Vice Principal David Servello, Willingdon Elementary School Vice Principal Stavros Spetsieris, Lester B. Pearson High School teacher Paul Karpontinis and Commissioner Bernard Praw. At each meeting, a student from the host school chairs the meeting, the duo hosting us leads the committee through an experiential leadership activity and then we discuss the issues on that month’s agenda. So far this year EMSAC members have discussed marketing our schools, safe school action plans, digital literacy, staying safe online, responsibility of bystanders in acts of aggression, francophones in English CEGEPs, management and educational success agreements and the public funding of private schools. Through this platform students are given a voice within the EMSB, developing them to become active citizens. Mayor Ferrandez hands out awards. FACE ART PROJECT: Over 200 students from both the English and French sectors at FACE School (3449 University) in downtown Montreal unveil their interpretations of “The Four Seasons” on January 16. The theme of the Four Seasons was chosen as it allows the students to think about the world around them. The project asked the students to reflect on the seasons of life and to design a mosaic panel based on this. When the work was unveiled judges selected the four best projects. Winning designs will subsequently be displayed at the Saint-Louis Square fountain in the Plateau (May 2018). Judging the designs were: Luc Ferrandez, Mayor of Le Plateau-Mont Royal; Annie Lamarre, Principal of FACE School; and Konstatine Veliovitch, the FACE artist in residence. Teacher Simone Nichol oversaw this excellent program. The winners were: Gaelle Caron, Karen Senneron, Bianca Jones and Yasmine Mahrez. Runners up were: Willa Morton, Martin Chan, Leanne Thibeault, Sciam Eternity Thomas, Xinyi Li, Mikayla Ovenden Beaudry and Charlotte Paquet. ORCHESTRA ANNIVERSARY: Current students and alumni are set to come together to mark the 20th anniversary of the FACE Symphony Orchestra (FSO) on Wednesday, February 21 (4:30 pm to 7:30 pm) at FACE School (3449 University) with a show-stopping concert. Established in 1988 by teacher Theodora Stathopoulos, the FSO has motivated hundreds of students to reach their full musical potential and has helped expand and enrich FACE’s String Department. In addition to the 25 current students in the FSO, six world-class soloists will also participate in the anniversary concert, three of whom are EMSB alumni. These alumni are: Brandyn Lewis (Double Bass in Orchestre Symphonique de Montreal 2017-2018), Lauren Tyros (Viola presently finishing music performance/Scholarship at McGill University) and Stephane Tetreault (International Soloist, Cello). Over the years, the students’ hard work, talents and passions for music have received outside recognition, most notably when students were invited to perform at Place des Arts in 2002 with the late Yuli Turovsky and Miklos Takacs as guest conductors. For more information and for tickets, please visit the FSO website: https://orchestresymphoniqueface.wordpress.com. EQUITAS AWARD: The EMSB's B.A.S.E. Daycare Program and Spiritual Community Animation Service received the Equitas— International Centre for Human Rights Education—National Play it Fair! award at Vincent Massey Collegiate on January 29 during a celebration with children and youth. Annually, Equitas acknowledges a Canadian organization, school or municipality with an award that promotes the advancement of human rights education. Equitas Associate Director of Programs Julie Kon Kam King and Yuval Hananayev of TD Canada Trust were at Vincent Massey to present Jennifer De Freitas, Project Development Officer with B.A.S.E, and Rocco Speranza, Spiritual and Community Animator, with their awards. Students will receive awards at the end of the school year. The EMSB’s Play it Fair! initiative was selected out of 180 schools across Canada. “This project was chosen due to its innovative and unique model which includes integrating high school, elementary, and daycare students. It shows great potential for fostering leadership,” said Kon Kam King. 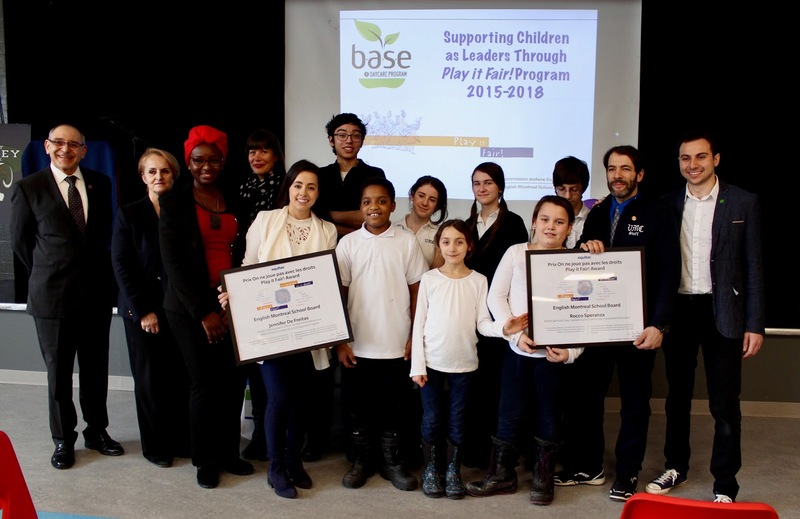 The EMSB was chosen for its Supporting Children as Leaders Through Play it Fair! initiative. This program has been offered in 10 daycares over three years, touching over 600 B.A.S.E. Daycare children and 55 students from Vincent Massey Collegiate (VMC). This year, eight daycares are benefiting from the program and engaging 27 VMC students via the Spiritual and Community Animation Service. Donna Manos and students Leila Zorzi and Fahima Khan. 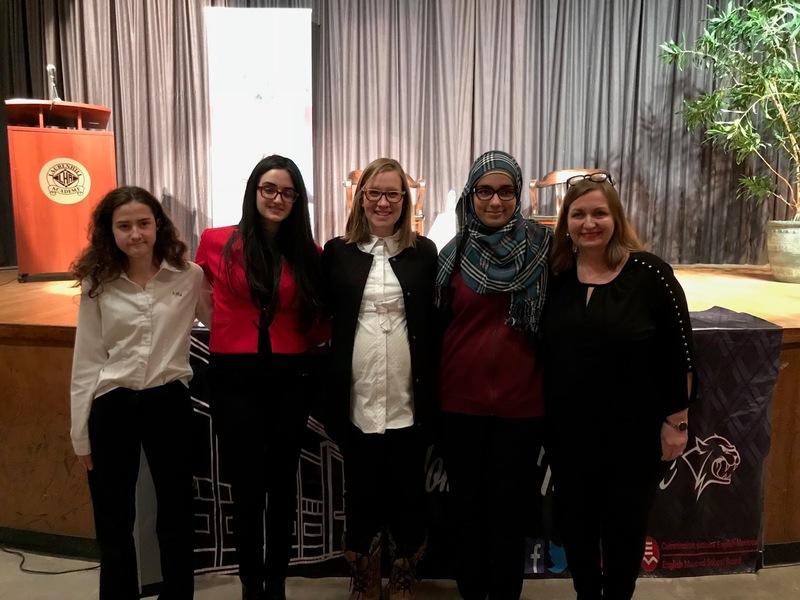 Lambropoulos spent over an hour discussing their day-to-day life, both personally and professionally, as well as delved into topics important to the students such as refugees, health care, and grassroots political involvement. For Lambropoulos, returning to LaurenHill Academy is always special as she both attended the school as a student, worked there, and at Rosemount High School, as a teacher before entering politics. McGILL WINTER FAIR: The McGill University Winter Fair will take place on Saturday, February 3 from 10 am to 2 pm. Parents and students will have the opportunity to meet current students, speak with admission officers, and connect with program advisors. There will also be an admissions overview for high schoolers and faculty specific information sessions for Medicine and Law. This event is open exclusively to Quebec high school students and CEGEP students and therefore it’s important for participants to register. Info: Joelle.neish@mcgill.ca . Youppi gets a warm welcome. TRANSITION PLANNING: What will my child do once he ages out of the education system at the age of 21? That question is on the minds of parents with children with special needs. The Make It Matter organization and Inspirations Newspaper presented Transition Planning: When and How for parents and professionals to address this question. The seminar took place on January 25 at the EMSB Administration Building in NDG. Admission was free. Guest speakers at the seminar included: Jennifer Grier, who discussed the importance of working with a social worker in preparing students with special needs for the transition to adult life; Pina Evangelista, who informed on the services that TÉVA (Transition École Vie Active) provides to students; and a personal account of the transition process from parent and EMSB Assistant Director of Student Services Julie René de Cotret. The seminar also included a discussion about housing opportunities for people with autism, intellectual and physical disabilities with Suzanne Cloutier and parent Harriet Sugar Miller shared the Club ALink experience in building an inclusive community, and housing. Guests were invited to meet with exhibitors, representing agencies, organizations and businesses which provide services to adults with special needs, including Agence Ometz, L'Étape, Blue Light Adult Program, John Grant and L.I.N.K.S. High Schools, Manulife Securities, Harold Akerman Accountant, Club ALink, C.A.R.E. Centre, and The Big Blue Hug. ADHD STUDY: Medication is currently the mainstay treatment for adolescents with Attention-Deficit/Hyperactivity Disorder (ADHD). Although medication is an effective treatment for core ADHD symptoms, it does not directly address the associated academic, social, emotional and behavioural impairments. Overcoming these would require skills in organization, time management, problem solving, emotional modulation, stress management and interpersonal rapport. However, little is known about the efficacy of psychosocial treatments targeting such skills for adolescents with ADHD, and there are few psycho social treatment options available to these adolescents in the community. The Montreal Children’s Hospital ADHD Research Program is a currently conducting a study which is designed to assess the efficacy of Cognitive Behaviour Therapy (CBT) for adolescents with Attention-Deficit/Hyperactivity Disorder (ADHD). This study will be open to both medicated and unmedicated adolescents. For more information or to refer a patient, please contact Tara Errington at 514-412-4400 ext. 23286. You can see a detailed letter on the subject here. Antonio Lacroce makes a point. ANNUAL REPORT: The EMSB held a public meeting on January 11 at which time it presented the results from its 2016-2017 partnership agreement with Le Ministère de l'Éducation et de l'Enseignement supérieur (MEES). Article 220 of the Education Act requires each school board to report on its partnership agreement in its annual report. This informs all stakeholders in its territory an account of the implementation of its strategic plan and the results obtained with regard to the goals and measurable objectives set out in the partnership agreement that was entered into with the MEES on July 1, 2010. The annual report informs the reader of the board’s objectives and targets set, the context as to why they were established, the results obtained, the board’s interpretation and the adjustments or corrective strategies to be implemented as a consequence of these results. This report also analyzes the degree of success of the strategies employed and their contribution to the attainment of the objectives, enabling the Board to identify strategies that are less effective and the need to be modified or discontinued. Where there is insufficient progress, the board re-examines once again its educational and organizational practices and determines what new strategies should be developed to increase student success. Also on January 11, members of the Central Parents Committee participated in a workshop aimed at providing feedback on what they would like to see included in the EMSB’s Commitment to Success Plan, presently in development. Parents had an opportunity to tell the board what areas of intervention the school board should prioritize when it comes to student success. Former EMSB Director General Antonio Lacroce served as the facilitator. The complete EMSB partnership agreement and annual report can be accessed here. NEW INTERNATIONAL CLUB AT WESTMOUNT HIGH SCHOOL: Elisa Medellin has started the “International Student Club” at Westmount High School for both international and local students. This initiative will enable a deeper understanding, and development, of new friendships among the international student community and local students. The club has had three meetings where students initiated activities designed to express their cultural differences and similarities. The meetings were full of discussions and experiences about different cultures and traditions through music, playing games and sharing food and snacks from each student’s country of origin. An excited foursome of national anthem singers. Victoria Paduano, Veronika Manhal, Gianluca Pece and Daniella Iaizzo sang O Canada. Owners Joe Perretta and his wife Lina Di Giovanni were longtime EMSB parent volunteers. Principal Steven Rebelo and Student Life Coordinator Olivia Misphailon (pictured above) dropped the puck. Canada on a monthly basis. In addition, each of the winners' schools will receive 50 YA books. The First Page will return in the fall of 2018. CBC Books' next student writing competition is the Shakespeare Selfie Student Writing Challenge, which will open in April 2018. If you're interested in other writing competitions, check out the CBC Literary Prizes. The CBC Nonfiction Prize is currently open and accepting submissions until Feb. 28, 2018. Info: jane.van-koeverden@cbc.ca. You can listen to Sari's interview after being crowned the winner here. CPAC ROUTE 338: CPAC, the Parliamentary TV channel, has launched a new literacy initiative. CPAC Route 338 is an innovative resource which provides a virtual trip across Canada allowing Internet users to learn more about our political history, the functioning of Parliament, the role of their representatives and the importance of citizens’ political participation. This democratic literacy project has three key components: The Route 338 website, which profiles and showcases all of Canada’s 338 federal ridings through photos, fast facts and videos from CPAC’s extensive archives; a series of giant floor maps detailing Canada’s 338 ridings, developed in partnership with the Royal Canadian Geographical Society; and a series of 11 curriculum-linked learning activities designed to help teach students from primary to senior levels about the many facets of a democratic society. You can see the website by following this link of Route 338. Teachers can reserve the Giant Floor Map by clicking on this address. DISABILITY AND PARENTHOOD:Most couples have questions about parenthood: Will I be a good parent? Do we have enough money? How will I handle a crisis? Being a parent with a disability is no different. You may be wondering if you should have children if you have an inherited disability, if your disability will hinder you from day-to-day parenting tasks, if your home is safe enough, or who you can turn to if you need help. You aren’t alone in your questions. The good news is that there are many resources available, and many are within your own community. A report conducted by DisabledWorld.com states that 10 percent of the world’s population lives with a disability—many of them parents just like you. Please Ashley Taylor's complete article here. SUMMER SCHOLARSHIP FOR YAD VASHEM: The Canadian Society for Yad Vashem Holocaust Scholarship Program is designed to educate Canadian educators, from Jewish and non-Jewish schools, and equip them with the right academic tools to teach about the Holocaust. Each year, CSYV selects up to 20 of the top candidates to attend a 19-day International Seminar on the Holocaust at Yad Vashem in Jerusalem. At the seminar, scholarship recipients learn from world-renowned experts in Holocaust studies about how to best teach the Holocaust. Educators learn how to introduce students to the topic, ensuring a safe learning environment with the provision of age and level appropriate materials to aid the learning process. Upon their return from the seminar, CSYV works closely with scholarship recipients for the next 2 years to implement Holocaust teaching best practices in their schools and communities across Canada, ensuring that the universal lessons of the Holocaust are conveyed to the next generation of Canadians. Applications for the 2018 scholarship are now being accepted until February 15, 2018. The Seminar in Israel runs from July 1 to 20, 2018. The Scholarship includes airfare, accommodation, tuition and partial meals while attending the seminar in Israel. To apply to the program, click here or visit CSYV’s website: https://yadvashem.ca/csyv-holocaust-scholarship-program. GALILEO AND WORK INTEGRATION PROGRAM: This year, Galileo Adult Centre has launched an innovative work program where Social Integration Services (SIS) students are learning invaluable work skills at school and in their individual stages at various employment locations. This work program provides support for students who are transitioning from school to a new part-time workplace. Galileo’s educators ease this transition by simplifying job-training pathways for SIS students with diverse needs and a strong desire and potential to work. Student JL works on his project. Michel Massé and Julie Mancini lead this work program and are enjoying seeing the students reap enormous benefits. M. Massé is responsible for placing individual students in their stages and the Socio Vocational Integration Services (SVIS) program. This includes assessing the interests, aptitudes, and abilities of each student, and courting companies that will offer internships. One of the biggest obstacles we face is educating the companies on the many positive outcomes they will receive when offering a stage to our SIS students. This year we have a partnership with Maxi (Pie-Ix), Home Depot (Anjou), Canadian Tire (Henri Bourassa), and Shell (Pie Ix). We have witnessed the number of students placed in these stages increase from three to 10. This is in part due to the one-on-one work preparation skills in the classrooms with their SIS teachers, and building relationships with potential employers in the community. It has also grown due to the positive feedback of the students that participated in last year’s pilot project. Their positive experiences in the working world have been contagious and have cultivated great interest with their peers. Mancini is responsible for training different groups of students in Galileo’s in-house work program. Students work in a newly designed work skills classroom where priorities such as cleanliness, teamwork, work methods, being polite and professional when in the work environment are adhered to. We have a partnership with Les Importations Cavan Inc. Tasks include: packaging, labeling, and piecing hairclips together. Furthermore, students collect and shred papers for the administration. Galileo is always on the lookout for new and innovative contracts. The SIS teachers and their parents are happy to see the positive changes in their students. One positive example of a success story involves a student JL, who did not socialize or smile until he began his stage at Home Depot. 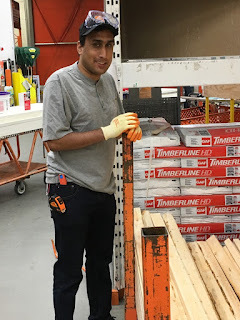 Now loving his work, he smiles and interacts with his peers and staff more often. “I see their self-esteem, independence, and communication skills improve,” share all teachers, who see the possibilities of each individual student. Parents have also confirmed by communicating with their teachers that their child’s maturity level has grown. INSCRIPTION À LA MATERNELLE : La CSEM a annoncé que la semaine d’inscription à la maternelle pour l’année scolaire 2018-2019 se tiendra du lundi 5 février au vendredi 9 février. Si un enfant est déjà inscrit à une école en particulier, ses frères et sœurs pourront s’inscrire une semaine plus tôt. Nous demandons aux parents d’inscrire leur enfant à l’école primaire de la CSEM la plus près de leur domicile où le programme en français de leur choix est offert. Pour de plus amples renseignements, veuillez composer le 514 483-7200, poste 3672 ou visitez le site Web de la Commission au www.emsb.qc.ca. Si vous inscrivez votre enfant pour la première fois, vous devrez fournir son certificat de naissance et son carnet de vaccination à l’école qu’il fréquentera. Les parents devront remplir des formulaires afin de permettre à l’école en question de présenter une demande de certificat d’admissibilité à l’enseignement en anglais. En vertu de la Charte de la langue française, un certificat d’admissibilité est généralement accordé aux enfants qui ont reçu la majeure partie de leur enseignement primaire ou secondaire en anglais au Canada, dont la mère ou le père a reçu la majorité de son enseignement primaire en anglais au Canada ou ceux dont le frère ou la sœur a reçu la majorité de son enseignement primaire ou secondaire en anglais au Canada. Veuillez prendre note qu’en raison de la législation qui régit les langues, ce critère exclut les études complétées dans une école privée au Québec. ROBOTIQUE, CODAGE ET INTELLIGENCE ARTIFICIELLE: C’est bien connu qu’à la Commission scolaire English-Montréal (CSEM), la robotique joue un rôle clé aux niveaux primaire et secondaire – tant dans le cadre du programme d’études que des activités parascolaires – vers l’acquisition de vastes connaissances et d’une meilleure compréhension des sciences et de la technologie. Bon nombre de nos écoles se sont illustrées en participant à maintes compétitions de robotique non seulement dans la région de Montréal, de Québec et au Canada, mais aussi ailleurs dans le monde. Les nombreux prix et récompenses remportés en font foi. Or, pour bien comprendre les rouages de la robotique et de l’intelligence artificielle, les élèves doivent se familiariser avec les processus antérieurs et postérieurs à la création d’un robot, tel le codage. Et l’acquisition de ces connaissances débute dès la maternelle. À l’aube de la semaine des inscriptions à la maternelle et au primaire, la CSEM a dévoilé de nouvelles initiatives des plus ambitieuses sous le thème « Robotique, codage et intelligence artificielle – Être fin prêt pour demain ». « Le concept de codage et la robotique vont de pair », a déclaré la présidente de la CSEM Angela Mancini lors d’une conférence de presse tenue à l’école primaire Merton à Côte Saint-Luc. La directrice adjointe des Services éducatifs et de la technologie (SET) à la CSEM, Anna Villalta, souligne que les élèves sont à l’avant-garde des plus récentes tendances et innovations dans le domaine de la robotique et des technologies. PLATEFORME ÉDUCATIVE CoSPACE ROBOT: La CSEM deviendra la toute première commission scolaire au Canada à mettre en place une plateforme éducative CoSpace Robot. Utilisée dans plus de 20 pays tels le Royaume-Uni, l’Allemagne, l’Autriche, le Japon, la Suède, le Mexique et le Brésil, la plateforme CoSpace Robot aide les élèves à développer des compétences en informatique, de même qu’à les initier à la programmation, au codage et aux algorithmes, dans un cadre plus stimulant et amusant. PROJET DE ROBOT NAO POUR RÉPONDRE À DES BESOINS PARTICULIERS: La CSEM lance une nouvelle initiative en matière de robotique qui sera particulièrement avantageuse pour les élèves ayant des besoins particuliers. Le projet de robot NAO est le fruit d’une collaboration entre la CSEM et l’équipe du Dr Thierry Karsenti de l’Université de Montréal, appuyé par les Services éducatifs et de la technologie (SET) ainsi que les Services aux élèves. NAO est un robot humanoïde qui sera programmé et codé par les élèves, avec le soutien du personnel des SET et en tenant compte des besoins spécifiques des élèves avec lesquels le robot sera appelé à interagir. Il est possible de programmer NAO pour qu’il réponde à des commandes, chante des chansons simples, lise des histoires, pose des questions, communique à l’aide du langage pragmatique approprié, exprime des émotions, et plus encore. ROBOCUP INTERNATIONAL À MONTRÉAL: La ville de Montréal sera l’hôte de la 22e édition de la Compétition et du Symposium RoboCup International du 17 au 22 juin au Palais des congrès. La CSEM jouera un rôle primordial dans le cadre de cette prestigieuse compétition de robotique puisqu’elle figurera parmi les principaux partenaires de l’événement. Sara Iatauro, conseillère en robotique des Services éducatifs et de la technologie à la CSEM, agira à titre de présidente d’honneur par intérim dans le cadre de RoboCup 2018. Il s’agira sans contredit du plus grand événement consacré à la robotique et à l’intelligence artificielle qui se tiendra à Montréal cette année. À la lumière des éditions antérieures de RoboCup International, la Ville de Montréal et le Palais des congrès estiment que les retombées économiques de cet événement oscilleront autour de 10 millions de dollars. NOUVELLES ÉCOLES STIAM: En janvier 2017, la CSEM avait tenu une conférence de presse afin d’annoncer son initiative STIAM (sciences, technologie, ingénierie, arts et mathématiques). À l’époque, ce projet pilote avait été mis à l’essai dans seulement deux écoles primaires, soit Général Vanier à Saint-Léonard et Pierre Elliott Trudeau à Rosemont. Chapeautée par les conseillers pédagogiques Sara Iatauro, Nicholas Doyon et Chad Leblanc des Services éducatifs et de la technologie, cette initiative s’étend aujourd’hui à 15 écoles. Les nouvelles écoles ayant emboîté le pas sont : Elizabeth Ballantyne à Montréal-Ouest; Pierre de Coubertin, Honoré Mercier et John Paul I à Saint-Léonard; Coronation à Côte-des-Neiges; Westmount Park à Westmount; Carlyle à Ville Mont-Royal; Gardenview et LaurenHill à Saint-Laurent; Michelangelo International à Rivière-des-Prairies; James Lyng (école secondaire) à Saint-Henri; Dalkeith à Anjou et Bancroft sur Le Plateau. UBISOFT ET FUSION JEUNESSE: La CSEM est également heureuse d’annoncer un partenariat avec Ubisoft et Fusion Jeunesse. Leader en matière de création, d’édition et de distribution de divertissement et de services interactifs, Ubisoft possède un riche portefeuille de marques de renommée internationale, notamment Assassin’s Creed, Just Dance, la série de jeux vidéo Tom Clancy, Rayman, Far Cry et Watch Dogs. Pour sa part, l’organisme Fusion Jeunesse mise sur l’apprentissage expérientiel en mettant sur pied des projets pédagogiques et innovants dans divers secteurs, y compris la robotique, la création de jeux vidéo, l’entrepreneuriat et le design de mode. Dès le début de la prochaine année scolaire, Fusion Jeunesse travaillera directement avec les professionnels d’Ubisoft afin de présenter certains aspects du jeu et du codage dans des écoles de la CSEM. Les élèves apprendront ainsi à créer des jeux vidéo qui graviteront autour d’enjeux tels que l’empathie et la résolution de conflits. Sur le plan pédagogique, ils aborderont les mathématiques, le français, l’anglais et l’histoire. Des concepteurs de jeux vidéo d’Ubisoft viendront également rencontrer les jeunes pour leur parler des emplois liés à ce secteur. MERTON, ÉCOLE PIONNIÈRE: En termes d’intégration de la robotique et de l’informatique au curriculum des sciences d’une école primaire, on peut affirmer que Merton a été une véritable pionnière à cet égard. En effet, depuis bientôt 15 ans, les élèves de cette école apprennent les rudiments de l’informatique et du codage, et découvrent comment les appliquer à la robotique. Merton s’enorgueillit du fait qu’elle fut la première école de la CSEM à inclure la robotique dans son programme d’études. « Parce que le monde entier évolue, c’est pour cette raison que la robotique occupe une place prépondérante dans le programme d’études à Merton et qu’il est si important d’enseigner le codage à nos élèves dès qu’ils commencent à fréquenter l’école. L’enseignement de l’informatique et de la technologie à un si jeune âge les aide à prendre davantage conscience du monde qui les entoure. Ceci leur permet d’être non seulement des utilisateurs, mais de devenir des créateurs », a déclaré Debbie Adams, enseignante en sciences, technologie et robotique à l’école Merton depuis 2012. NOMINATIONS: La directrice générale de la CSEM, Ann Marie Matheson, a annoncé la nomination intérimaire d’Evelyne Alfonsi à titre de directrice générale adjointe (Éducation) et de John Pevec en qualité de directeur régional (secteur est). Madame Alfonsi cumule plus de 25 années d’expérience à la CSEM, tant dans des écoles primaires que secondaires, et plus récemment au centre administratif. Pour sa part, M. Pevec était jusqu’à tout récemment directeur du Centre d’éducation des adultes du High School of Montreal. Il œuvre au sein de la CSEM depuis plus de 20 ans, dans les secteurs des jeunes et des adultes. Mario Argiropoulos est maintenant directeur par intérim au centre High School of Montreal; il a occupé le poste de directeur adjoint des SÉAFP au cours des dix dernières années. DANTE FÊTE NOËL EN GRAND TOUT EN PENSANT AUX « VIEUX AMIS » : Les parents des élèves de l’école Dante ont organisé une fête de Noël. Journée pyjama, déjeuner conventionnel, danse et visite du Père Noël étaient au rendez-vous. Tout s’est déroulé à merveille. À l’école Dante, on ne peut s’empêcher d’avoir une pensée pour les plus démunis lors de la période des Fêtes. C’est pourquoi les enfants ont préparé de magnifiques cartes de souhaits pour la communauté des Petits frères, dont la mission est d'accueillir et d’accompagner les personnes seules du grand âge afin de contrer leur isolement en créant autour d'elles une famille engagée et fidèle jusqu'à la fin de leur vie. Lors de la fête de Noël, organisée pour nos vieux amis, qui a eu lieu le 25 décembre au Sheraton Montréal, les cartes des élèves ont été remises à 420 des participants de cette soirée. Les participants ont été très heureux de recevoir ces cartes. La grande famille Dante vous souhaite une bonne et heureuse année 2018! COMITÉ CONSULTATIF DES ÉLÈVES : Le comité consultatif des élèves de la CSEM s’est réuni une fois par mois jusqu’à présent cette année. Ce comité est formé de deux élèves de chacune des écoles secondaires de la CSEM. Les réunions ont lieu en alternance entre les secteurs est et ouest du réseau. Au nombre des participants à ces réunions figurent également : Pela Nickoletopoulos, directrice régionale; David Servello, directeur adjoint à l’Académie LaurenHill; Stavros Spetsieris, directeur adjoint à l’école primaire Willingdon; Paul Karpontinis, enseignant à l’école secondaire Lester B. Pearson et Bernard Praw, commissaire. À chacune des réunions, un élève de l’école hôte préside l’assemblée. Le duo de l’école hôte dirige les travaux du comité par l’entremise d’une activité de leadership expérientielle, et les questions à l’ordre du jour font ensuite l’objet de discussions. Jusqu’ici cette année, le comité s’est penché sur la mise en valeur de nos écoles, les plans d’action pour des écoles sécuritaires, la littératie numérique, la sécurité en ligne, la responsabilité des spectateurs lors d'actes d’agression, la présence des francophones dans les cégeps anglophones, l’entente de gestion et de réussite scolaire, de même que le financement public des écoles privées. Par l’entremise de cette plateforme, les élèves ont la possibilité de s’exprimer au sein de la CSEM, ce qui les aidera à devenir des citoyens engagés. MAKE IT MATTER: Qu’adviendra-t-il de mon enfant une fois qu’il aura 21 ans et devra quitter le système d’éducation? Cette question préoccupe les parents d’enfants ayant des besoins particuliers. L’organisme Make It Matter et le magazine Inspirations ont présenté le séminaire « La planification de la transition : Quand et comment » aux parents et professionnels afin d’aborder cette question. Ce séminaire a eu lieu le 25 janvier, au centre administratif de la CSEM à NDG. L’admission était gratuite. Au nombre des conférenciers invités, mentionnons : Jennifer Grier, qui a discuté de l’importance de travailler avec un travailleur social afin de préparer la transition des élèves ayant des besoins particuliers vers leur vie adulte; Pina Evangelista, qui a présenté les services qu’offre TÉVA (Transition École-Vie Active) aux élèves; et Julie René de Cotret, parent et directrice adjointe des Services aux élèves à la CSEM, qui a livré un témoignage personnel du processus de transition. Suzanne Cloutier a également abordé les possibilités de logement pour les personnes autistes ou atteintes d’une déficience intellectuelle ou physique et, à titre de mère, Harriet Sugar Miller a partagé l’expérience du Club ALink pour créer une communauté inclusive. Les participants ont été invités à rencontrer les exposants, agences, organismes et entreprises qui offrent des services aux adultes ayant des besoins particuliers, notamment l’agence Ometz, L'Étape, le programme Blue Light pour adultes, les écoles secondaires John Grant et L.I.N.K.S., Placements Manuvie, le comptable Harold Akerman, le Club ALink, le centre CARE et The Big Blue Hug. RAPPORT ANNUEL: La CSEM a tenu une assemblée publique le 11 janvier au cours de laquelle elle a présenté les résultats de sa Convention de partenariat 2016-2017 avec le ministère de l'Éducation et de l'Enseignement supérieur (MEES). L’article 220 de la Loi sur l’instruction publique stipule que toute commission scolaire doit rendre compte de sa Convention de partenariat dans son rapport annuel afin de fournir à l’ensemble des intervenants sur son territoire un compte-rendu de la mise en œuvre de son plan stratégique ainsi que les résultats obtenus en lien avec les buts et les objectifs mesurables énoncés dans la Convention de partenariat conclue avec le MEES le 1er juillet 2010. Le rapport annuel vise à présenter au lecteur les cibles et les objectifs fixés par la Commission, la raison pour laquelle ils ont été établis, les résultats obtenus, l’interprétation de la Commission de même que les ajustements ou les correctifs à apporter à la lumière de ces résultats. Le rapport contribue également à analyser le niveau de réussite des stratégies déployées et leur contribution à la réalisation des objectifs, ce qui permet à la Commission d’identifier les stratégies moins efficaces de manière à les modifier ou les supprimer. Lorsque les progrès sont insuffisants, la Commission passe en revue ses pratiques éducatives et organisationnelles et détermine les nouvelles stratégies à mettre en place afin d’accroître la réussite des élèves. En outre, le 11 janvier, les membres du comité central de parents ont pris part à un atelier ayant pour but de recueillir leurs commentaires sur ce qu’ils souhaiteraient retrouver dans le Plan d’engagement vers la réussite de la CSEM dont l’élaboration est présentement en cours. Les parents ont ainsi eu l’occasion de suggérer à la Commission les domaines d’intervention à prioriser lorsqu’il est question de la réussite des élèves. L’ex-directeur général de la CSEM, Antonio Lacroce, a agi à titre de facilitateur. Pour consulter la Convention de partenariat et le rapport annuel de la CSEM, cliquez ici. The next Focus will be published on February 22, 2018. Submissions should be made to Michael J. Cohen preferably by e-mail (mcohen@emsb.qc.ca) by February 17 at Noon.